So we're back for another week, let's go! 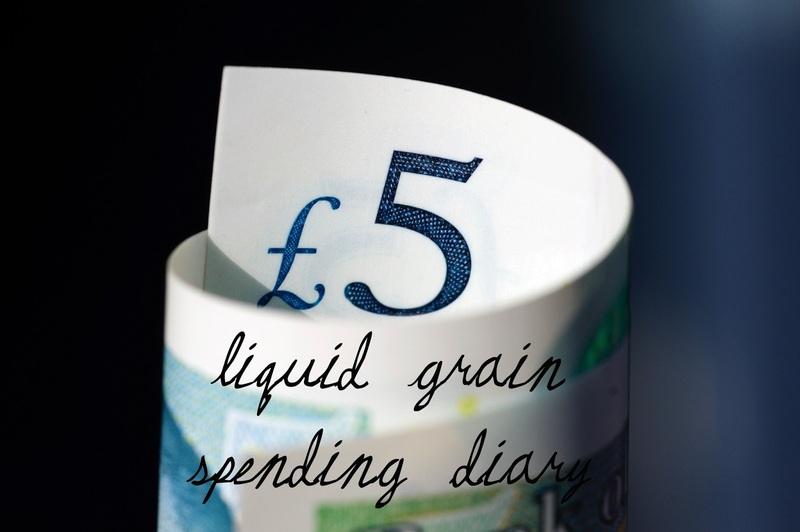 Remember if you would like to do your own spending diary (anonymously or not) please get in touch! Mum and I have had a great time in St Andrews but it's time for us to head home. So we have breakfast in the hotel and then we go for a nice walk on the West Sands beach, pack up the car and hit the road! Because I'm super organised, I've made a physio appointment to get on the way home. I've not been to physio in almost two years so I'm subjected to a telling off from Stuart for not looking after myself and a lot of pain! It's worth ten times the £40 it cost me to loosen up! Back on the road and our next stop is near Biggar for Mum to pick up some fabric for Solway Silver, while she shops I munch down a sausage roll and cake from a farm shop which costs me £8.10. Next up we sidetrack to New Lanark to visit the Textiles exhibition which showcase artists like Picasso and Warhol. Mum pays entry for both of us and we both really enjoy the exhibition - I will probably do a full post on this soon! Afterwards I do treat myself to a 20p postcard for my journal! Finally we end up at home and unpack, a Tesco delivery with cleaning supplies, toiletries and drinks arrives at 8pm and costs me £42.59 and I run a hot bath to try and ease my physio pain before bed! It's my last day of annual leave and I've officially decided that I like it and I could do with a much longer time off! Anyways, once I'm up I do some cleaning and pop to Tescos for some actual food. It's £8.05 for what seems to mostly consist of a rotisserie chicken and some creme eggs. Hetty's nails need a wee clip so I take her to the vets. The poor wee thing hates the vets so she shakes the whole time - £7.76. Home now and feeling like a terrible person, so I'm hand feeding Hetty some of my chicken from earlier. Tilly gets some too to keep it fair, they're #blessed to have me. We then go to the big farm shop to get something for dinner, we decide on some pork fillets wrapped in streaky bacon and also get some organic green beans and local mushrooms - Matty pays. Next on our exciting Saturday agenda is a dog walk, however disaster strikes and I hit a pothole on the way out of town. The weather has been terrible recently and the roads are in a terrible state. Matty puts the spare on and I manage to find a garage still open on a Saturday afternoon which costs me a reluctant £45 but better today than tomorrow, which would really screw me up! Leave is officially over, so I need to head back down to Oxford. So after breakfast I pack up the car and hit the road. I need to top up on fuel because it's such a long journey, so £12 fills it up at Carlisle and then back on the road. Traffic is pretty good, so I make good time. The toll road costs me £4.80 then I'm home. I'm in London today but I am mega broke - payday can't come quick enough so I need to reel things in until then. First up it's £6.10 to park at the train station then I top up my Oyster card with £10 at Paddington. Work is non-stop so I don't really have the time or the desire to buy lunch when I have so much food at home so I hold on until I'm back and have stuffed mushrooms and pak choi. Now I'm back at work and need to save this spending diary isn't exactly exciting I'm afraid. Again I'm working from home so another nil spend day (thankfully).